UMMC has a Portable Emergency Unit at WalMart in Louisville. In the event of an emergency all Winston County residents please be aware that University Medical Center has a portable Emergency Medical Unit set up at the Louisville Wal-Mart parking lot. If you have an emergency please go there until further notice!!! MS storm victims and volunteers in collaboration with Oservs (volunteers), Vowells, Applebee's, McClane Foods, Southern Tradition Tailgating, T&C Ice, Dollar General, United Produce, 4S Foods, PepsiCo, and Mitchell Distr. 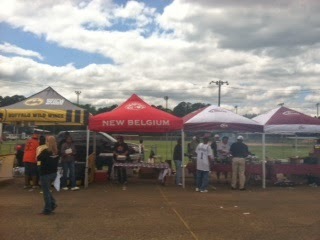 of Starkville, MS. Also, thanks to Olive Garden of Tupelo, MS and Verizon Wireless. Main Street Medical will be open Thursday through Saturday from 7:00 A.M. until 11:00 P.M. and Sunday from 12:30 P.M. until 5:00 P.M. Louisville Medical Associates, Dr. Peters, Dr. Suttle and staff will be there to meet your medical needsalong with Main Street Staff. Times for next week will be posted when available. For those needing assistance and supplies, the Louisville Coliseum is serving as ground zero. Local officials and MEMA will have the coliseum open from 8:30 am til 5:00 pm for those who need food, water, clothing, etc. Be prepared to show a photo ID and proof of residence to prevent fraud. Those who are not affected by this disaster should not attempt to take advantage of this service. Supplies are pouring in and officials indicate that clothing and furniture needs have been met. Please do not provide more at this time. Food and household items are always needed - including towels and bed linens. Curfew across the County and City is 9 pm til 6 am until further notice. Devastated areas will be heavily patrolled to prevent looting. Removing debris from the property of another without their permission is not legal- even if your intentions are honorable. Get permission or face a felony charge. Two arrests have been made under these circumstances. You can also make financial donations to Red Cross and Salvation Army and indicate "For Winston CountyRelief"
Donations are needed for the Louisville Municipal School District students affected by the F4 tornado that hit Winston County on April 28, 2014. Uniform shirts in maroon, red, grey and white. Uniform pants/shorts in khaki and black. Monetary donations may be sent to Fair Elementary, Louisville Elementary, Eiland Middle, Louisville High School Activity Funds, and Noxapater Attendance Center PTA. 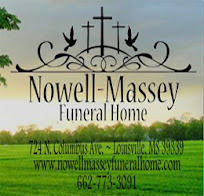 LeAnn Boswell at Noxapater Attendance Center 662-724-4241. 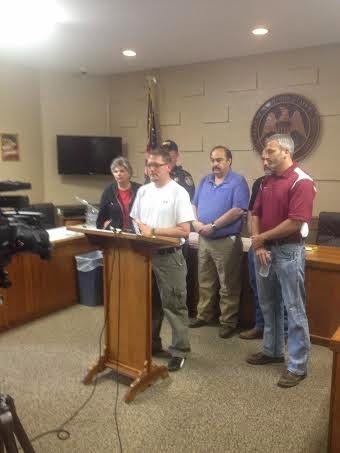 A local disaster relief fund has been established throught the Winston County Partnership to accept donations. Funds will be adminstered through the Winston Community Development, Inc which is a 501c3 making your contributions tax deductible. Funds will be audited and use will be for relief efforts. information on the victims of Monday's deadly tornado across Winston County. Flanked by City, County and Emergency personnel, Gregory indicated that all nine victims were residents of Winston County and that one died after transport to University Medical Center. Gregory stated that the cause of death in all cases was determined to be multiple trauma. If your house was damaged but still structurally standing, Emergency officials indicate that you should be certain to turn off eletrical breakers to prevent any possible fire or electrocution dangers. We are receiving numerous calls about how to locate a nursing home resident. WMC was severely hurt in the tornados. NO RESIDENT WAS INJURED!!!! When WMC admits a nursing home resident we have the family appoint a responsible party. A responsible party is a contact for our staff to notify in the event of an emergency. Prior to sending any of our residents to other locations our responsible party was notified. If you have a question about a resident please contact his or her family to find out who the responsible party may be. We appreciate your understanding!!! Also, we will keep you update on personal belongings of residents and how to get them at a later time. Please do not report to the WMC campus to pick up the belongings!!!!! We ask you to PLEASE not come to the campus at this time. We will notify you when you can come!! Stay tuned to WMC Facebook page for further updates. Please share all our status updates to keep our community informed!!! Like many of you, we at WinstonWebNews have been dramatically impacted by the events on Monday. While our office suffered no damage, we lost our internet connectivity and cell phone coverage was poor which limited our posting abilities. We were able to get some information out during and after the storm and we hope we were able to help in some way. Things are slowly getting better. A hard count of properties damaged or destroyed is not available but is projected to be well over 300 residences and commercial properties. Shelters are set up at First Methodist and First Baptist Churches in Louisville. The shelter at Nanih Waiya was established for overflow. Supplies of food and water and other necessary materials are coming into the county through the efforts of several organizations and government agencies. If you have supplies that you would like to donate, bring them to the Louisville Coliseum on Ivy Avenue. Needed supplies include towels and bed linens. Financial contributions can be made thru the Winston CommunityDevelopment, Inc. Find more information on the Facebook page "Winston County Tornado Relief"
Damage to the Winston Medical Center was extensive. All patients have been moved including nursing home patients. (Some nursing home residents were sheltered temporarily at 1st Methodist but have since been relocated to long term care facilities. A mobile hospital has been set up at Winston Medical and triage will be performed there. Those needing additional medical wil be sent to other area hospitals. There is a curfew due to security issues across Winston County from 8 pm til daybreak. This will continue until otherwise indicated. Power and water have been restored to some areas however many areas may be without utilities for an extended period. Heavy damages were experienced in a large part of the county including some of the following: Plattsburg, Center Ridge, Jordan Circle, Eiland Plaza and along Armstrong, parts of hwy 397, Johnson Avenue, Winston Medical Center, East Main (hy 14e) McCullough Road, Brooksville Rd, Richardson Rd and North Columbus. Local County and City Officials were just briefed by the National Weather Service on the hazardous weather conditions over the next 24-36 hours. The majority of the state of Mississippi is under a flash flood watch until 7 am Tuesday morning. This includes Winston County although widespread rainfall projections have decreased slightly down to 1-3 inches from earlier projections of up to 5 inches. Still local amounts could be heavier. There is still a moderate risk for damaging winds, large hail, locally heavy rains and possible tornado activity. Storms should develop in our area around mid to late afternoon on Monday and continue into the evening. This will be our time of greatest risk. There is also risk of storms developing again on Tuesday. Winston Web News will continue to monitor and keep you posted as conditions change and develop. 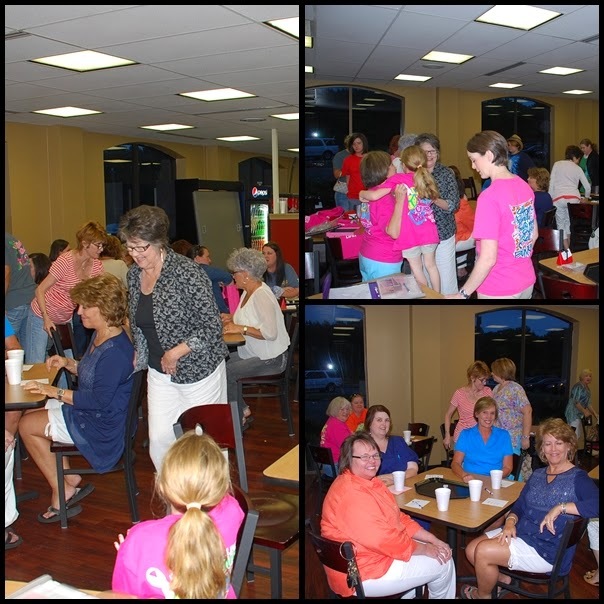 Local Mississippi Scholars will be honored on Wednesday with a breakfast meeting at Lake Tiak O'Khata at 8 am. The Lions are in Town!! The Mississippi State Lions Convention will be held right here in Louisville at Lake Tiak O'Khata beginning on Friday. The public is invited to a free concert by the Ms All-State Jazz Band on Friday evening at around 7-7:30 pm at the Lake near the restaurant entrance. Bring your lawn chairs. Might even be a few fireworks after the concert!! Friday brings the annual Relay for Life event held at the Louisville High School football field. The event always includes the Survivors Walk and lighting of luminaries entertainment as well. This year includes a sky lantern release. And last but not least, the kids will have a great time at the annual Legion State Park Fishing Rodeo. Registration starts at 7 am . Click here to get all the details. Tours were provided of Louisville Municipal School District schools on Wednesday, April 23 for community leaders and civic groups. WinstonWebNews took the opportunity to visit with the staff and teachers of Fair Elementary as a small group toured the halls and classrooms. Visitors were also entertained by "The MelodyMakers" in the school courtyard. Fair includes kindergarten, 1st and 2nd grades comprised of 8-9 classes at each grade level as well as 3 Pre-K classes totalling about 640 students. 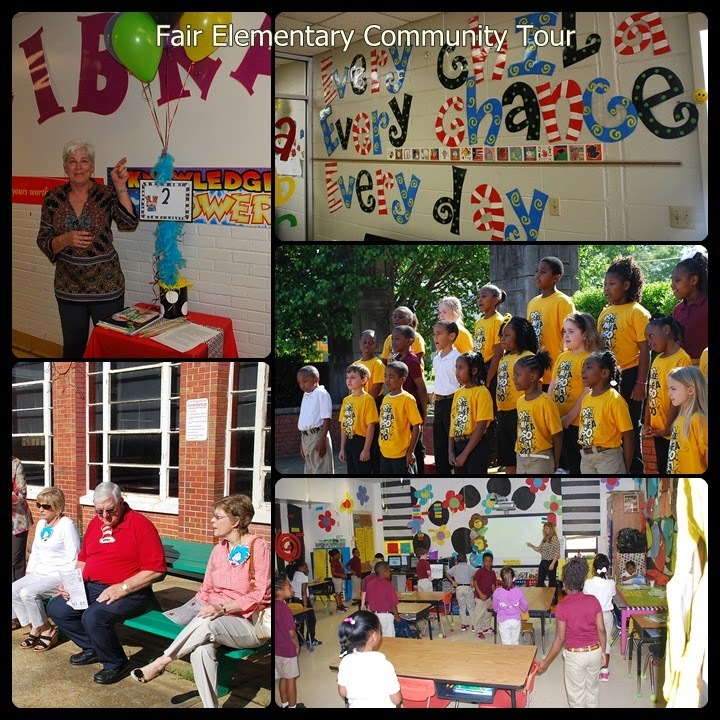 Fair's programs include Special Education, Developmentally Delayed classes including 2 kindergarten interventionists, the MelodyMakers, an Accelerated Reading program that includes a vast library program and participation in the TAG program in 2nd grade. 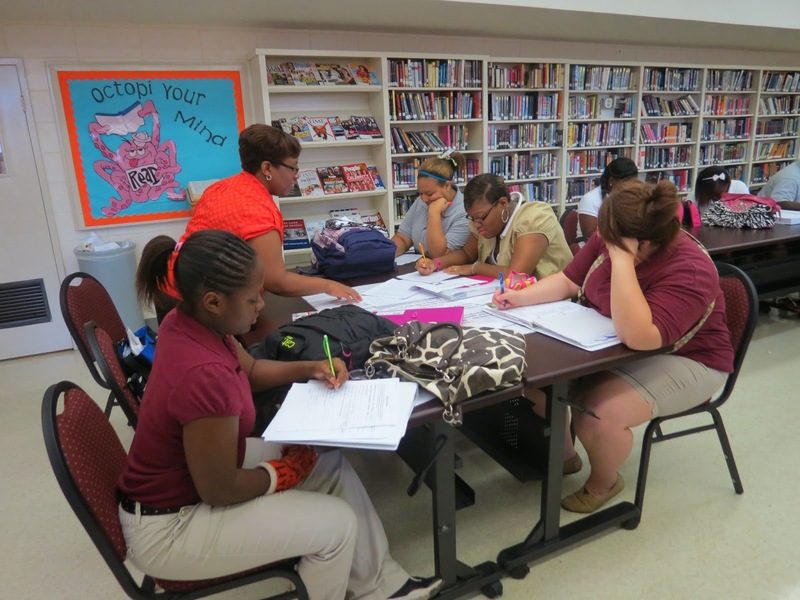 The DREAMS program is also on the Fair Campus providing intervention and afterschool programs. The Open House and Ribbon Cutting scheduled for Winston Medical Clinic - Noxapater on Monday, April 28 has been cancelled due to the expected bad weather. This event is expected to be rescheduled at a later date. Mississippi Governor Phil Bryant was expected to speak at the event. WinstonWeb will keep you posted on the date and time of reschedule. Noxapater and Nanih Waiya graduated from the DARE program on Friday, (April 25) at the Louisville Elementary Auditorium. The ceremony was opened with a Pledge of Allegiance led by local scouts, the presentation of colors by JROTC from Louisville High, The song "America" by Mrs. Hollingshead's 5th Grade Singers and the welcome was given by Aryanna Lyons, a 5th grade DARE Student. Students and parents heard encouragement from local leaders including Tonya McWhirter, Louisville Police Department Dare Officer, Police Chief L.M. 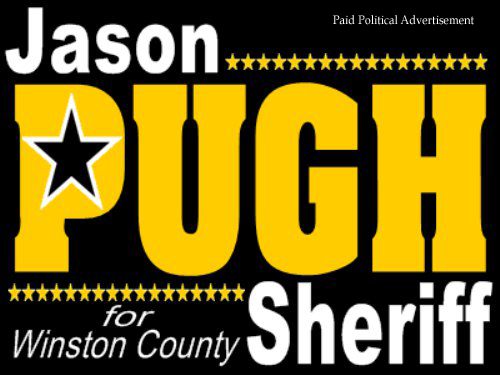 Claiborne, Sheriff Jason Pugh and Mayor Pro-Tem Eugene Crosby. The guest speaker for the event was Major Andrew S. Rendon, an Afghanistan veteran and the Mississippi State Assistant Dean of Student Affairs. Rendon's message to the students was "Remember this Day" when faced with peer pressure and temptations to use and abuse drugs, alcohol and tobacco. 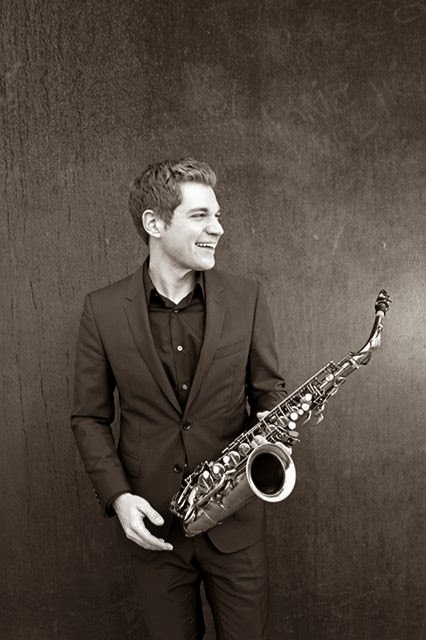 Nathan Woodward will be in concert at Louisville FUMC this Sunday evening at 6 o'clock. Make your plans to join us for a very special time of worship as "Nathan's improvisational jazz style and passionate melodies...encourage the heart and stir the soul". Cloud 9 Orchestra says, "He's playing for God. Nathan's talents are not his own, and he is clear about that. His work is not a reflection of himself, or even a celebration of himself. His celebration, his talent, his desires, comes down to worship." Please go to www.nathanwoodward.com and hear Nathan's story in his own words. Do you have water damage or other cleanup needs from the recent storms? - Call SERVPRO!! (Friday, 4-25) after a series of storms moved across the area on Thursday evening. The storm brought high winds, heavy rain, significant hail and a reported funnel cloud resulting in power outages,tree damages, some limited structural damage but fortunately no loss of life or serious injuries. The public is invited to a Town Hall Meeting concerning the EXCEL BY 5 program recently initiated across Winston County. The meeting scheduled for April 29 at 6 PM at the Louisville Elementary School Auditorium is to kick off public support for this early childhood program. Mississippi Community College’s Golden Triangle campus Lyceum next week. Rowland and Austin Rivers Roberson. 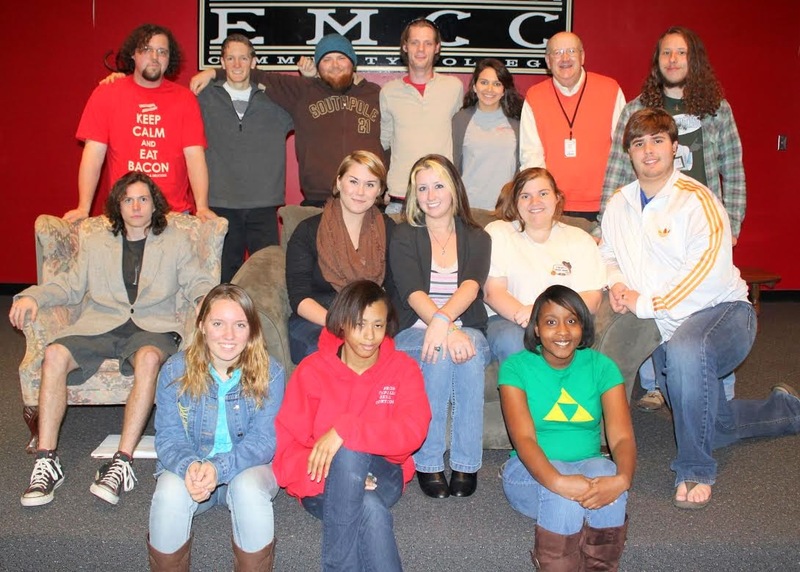 On the third row are Zach Berryhill, Michael Thompson, Zach Luther, Jeffrey Clark, Tori Butler, Dr. Don Vaughan and Graham Young. There will be a prayer service for Marcus Banks today at 5 pm at the Louisville High School Football Stadium. All are invited to attend and participate. Marcus was injured in Spring football practice at the school on Tuesday and is in ICU at University Medical Center in Jackson. The post-season bound East Central Community College fast-pitch softball team dropped its regular season finale to Pearl River Community College in a MACJC South Division doubleheader held Tuesday, April 22 on the Poplarville campus. The Lady Diamond Warriors fell 4-3 in the opener and were outscored 7-3 in the nightcap. EC fell to 32-14 overall and 17-11 in league play following the twin bill. The Lady Diamond Warriors begin post-season play as the No. 4 seed in the South and will battle North # 1 seed Itawamba Community College in a best-of-three series scheduled Friday-Saturday, April 25-26, on the Fulton campus. The No.17-ranked Lady Indians completed regular season action with 33-10 overall mark and 21-3 record in North Division competition. Reports from school officials provide some potentially good news this morning (Thursday, April 24) concerning the Louisville High football player injured in Spring practice earlier this week. Sixteen year old sophomore Marcus Banks is in ICU at University Medical Center in Jackson and recovering from spinal surgery performed on Wednesday. There has been concern of paralysis resulting from the injury and as is always the case in such injuries, it will be a period of time before the full extent of damage and recovery will be known. However, officials are indicating that it is a positive sign that Banks was able to move his toes this morning. If you would like to contribute money or possible food gift cards from McDonalds or Subway for the family to cover costs, please contact Shannon Sewell Smith or the school district for more information. Fifth Grade DARE Graduation time is here again. The public is invited to attend the graduation ceremony at the Louisville Elementary School Auditorium on Friday, April 25, 2013, at 9:00 a.m. 214 students from Louisville Elementary, Nanih Waiya, Noxapater, and Winston Academy will be participating. The guest speaker for the event will be Major Andrew S. Rendon, the Vice President of Student Affairs at Mississippi State University. Individual students will be recognized for their achievements as well as classrooms from each school. Education is not limited to the inside of a classroom. 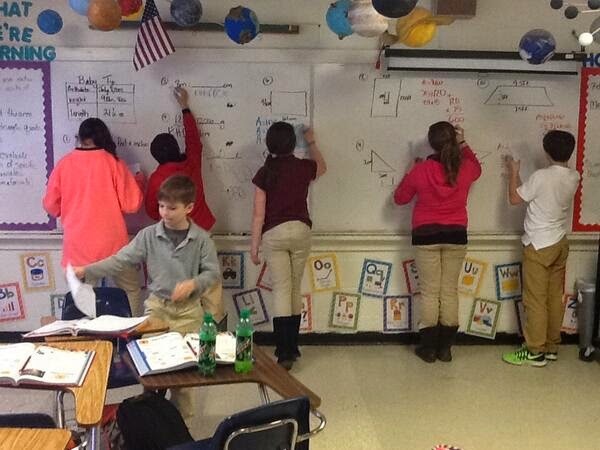 These students at Fair Elementary are combining physical education with learning about parachutes and domes. A Louisville High School Sophomore, Marcus Banks was injured in Spring football practice at the school on Tuesday. The 16 year old Banks was airlifted to University Medical Center in Jackson where he underwent a procedure last night with possible surgery this morning. Tuesday's practice was the first Spring practice in full pads and Banks was injured during a drill at around 4:05 pm. Coaches and trainers immediately recognized the seriousness of the injury and called 911 and did not move Banks. Emergency personnel arrived on the scene and also determined that the player should not be moved by ambulance and that the extent of injury was possibly severe. By 5:10 pm, Banks was on his way to University Medical Center in Jackson by air ambulance. His condition is unknown at this time but reports indicate that by last night, Banks had some use of his right hand and some feeling had returned to his left arm as well. Last Fall, a Nanih Waiya player was injured in a similar manner during practice. After several surgeries and therapy, he has since resumed sports activity. 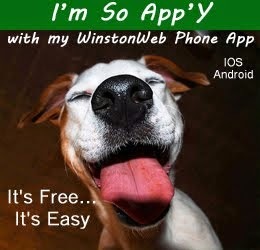 WinstonWeb will update as information becomes available. East Central Community College’s tennis teams recorded victories over Holmes Community College in matches held Wednesday, April 16, 2014, in Goodman. The Lady Warriors cruised 8-1 and the Warriors posted a 7-2 victory. In women’s singles, Hannah Peoples of Winston Academy defeated Johanna White, 6-1, 6-0; Alana Turner of Florence beat Laurie Alvis, 6-2, 6-2; Amber Pierce of Leake Academy defeated Jennifer Rule, 6-2, 6-4; Nan Hartness of Winston Academy beat Katherine Woods, 6-1, 6-0; Hannah Smith of Leake Academy beat Lori Nesbitt, 6-1, 6-2; and Katlyn Patrick of Forest defeated Anna Claire Shores, 7-5, 6-1. Winston County Supervisors had a short agenda on Monday as they dealt with County business. The Supervisors first heard from Marion Triplett concerning County support for a grant to provide a possible van or bus to be used for medical transportation of those in need in Winston County. This would be part of an Easy Tag program associated with the Mississippi Department of Transportation and would require 20% matching funds amounting to roughly $20,000. These funds could come from multiple sources across the County. The Louisville Animal Shelter simply has too many large and adult dogs. If you have ever considered adoption, now is a great time to provide a home for a loving companion. 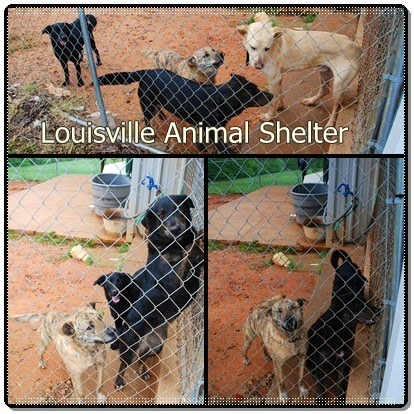 The Shelter is located at 110 Thompson Street in Louisville and you can call 662-773-4320. Adoption fees are $20. Open Mon-Fri 8am-12pm. After hours call 662-705-0398 to adopt. Every month the Red Hills Quilt Guild displays a handmade quilt at the Winston County Library. 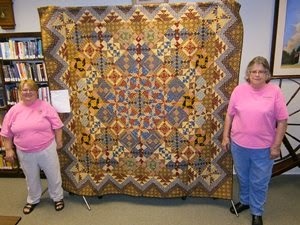 This month’s quilt was pieced by Irene Rogers (right) and pieced by Betty Lewis (left). Mrs. Rogers said she made the quilt for her grandson, Chad Lewis. Civic Groups/Elected Officials and Others are Invited to Tour LMSD Schools TOMORROW!! member of an organization interested in our schools and their progress, you are invited to participate in a tour of any of the local public schools tomorrow at 9:00 am. (Wednesday, April 23). LMSD Superintendent Ken McMullan issued the invite: "We are very proud of the things that our schools have going on and would like to showcase each and every school. Presentations will be made by students and school personnel that will be informative and unique to the school that you choose to tour." You can tour any of the schools including: Fair Elementary, Louisville Elementary, Eiland Middle School, Louisville High School, Winston Louisville Career Center, Nanih Waiya or Noxapater. Please make plans to be at the school prior to 9:00 as the tours will begin on time. The tours should last approximately an hour and you can choose the school of your choice to tour. Participants are asked to be prompt to view the initial presentation. The East Central Community College Student Art Association is hosting a reception to officially showcase the Spring 2014 Student Art Exhibition. The reception will be held at 2:30 p.m. Thursday, April 24, 2014, in the lobby of the Vickers Fine Arts Center on the Decatur campus. East Central Community College’s baseball team posted a pair of victories over Lawson State Community College during the regular season home finale held Friday, April 18, 2014, at the Clark/Gay Baseball Complex in Decatur. Sophomore players were also recognized during the non-division matchups. The Louisville Lightning 9 Yr Old USSA Baseball AA TravelSquad won the "No Pain No Gain" Tournament over the Easter weekend. The Lightning won 4 games total at Tupelo's Bullard Park with one win on Friday night followed by three in a row on Saturday. 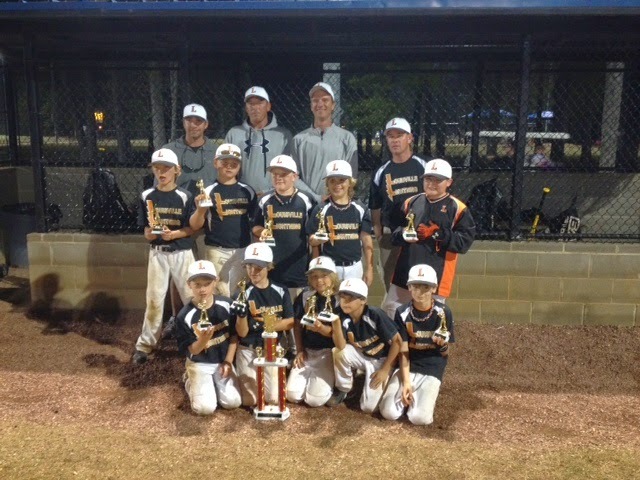 The 9 year olds defeated the "Naturals" from Monroe County in the championship game. The bats came alive and the team used 8 different pitchers over the weekend to take their first tournament win of the 2014 season. Team coaches are Greg Wright, Chris Stevenson, Joey McGinnis & Brent Hollis. PEARL, Miss. – U.S. Rep. Gregg Harper (R–Miss.) today awarded Germantown High School junior, Avery Roberson, as the overall winner of Mississippi’s Third Congressional District 2014 Congressional Art Competition. Roberson’s entry entitled, “Date Night,” will be displayed in the U.S. Capitol for one year beginning in June. Let's support our local retailers this weekend!! Spring is here and there's lots of activities going on. Be sure and shop at home first for those items we need and to prepare for upcoming events. 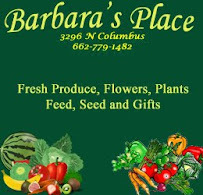 Barbara's Place on N. Columbus is the place to find all your lawn, garden and farm needs. They have plenty of bedding plants, garden plants, seed, fertilizer, feed and landscaping supplies. This is a great weekend to get caught up on that outside work. 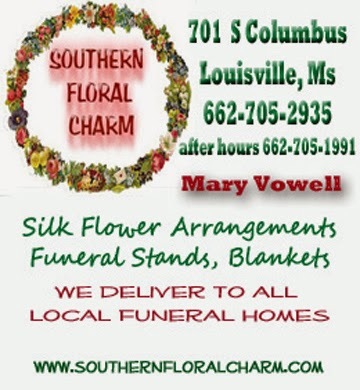 May is memorial month and there is no better place than Southern Floral Charm on S. Church to find an arrangement or have one custom designed. Lots of gift items as well. Street in Louisville is the place to find something special for Mom this year. 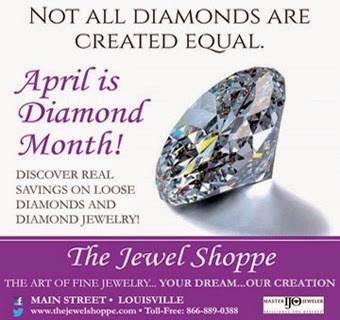 The Jewel Shoppe - The Diamond Store has a collection of fine jewelry, watches and gifts. 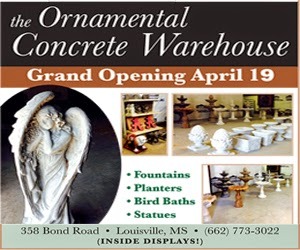 Saturday is the Grand Opening of the Ornamental Concrete Warehouse at 358 Bond Road. Drop by to welcome them to Louisville and see their selection of fountains, bird baths, statues and selection of art pieces for your yard. City of Louisville Officials met with representatives of a national retail consulting, market research and development firm on Tuesday in an effort to recruit more businesses to the area. Kelly Cofer with "The Retail Coach" provided information on his company's services to assist communities develop a retail economic development plan that includes collecting and analyzing demographic data, recognizing an area's strengths and weaknesses and assisting with marketing to the right potential retailers and restaurants while supporting existing businesses. The Winston County library held their annual City & County Official Appreciation Luncheon as part of the celebration of National Library Week. Government officials, media,Friends of the Library and staff enjoyed the meal prepared by members of the Friends of the Library Luncheon committee chaired by Betty Mills. Lots of baseball and softball going on but with all the rain some schedules have been changed - You may want to call your school to verify dates and times. A benefit will be held on Friday, April 18 at the First Baptist Church in Noxapater for Hunter Rogers. Scheduled to perform are Sean Greer, the Wells Brothers and Adam Crabb. All proceeds from the benefit will go toward medical expenses for four year old Hunter who is battling leukemia. The program starts at 7:00 pm and a love offering will be taken. A public hearing on the property located at 200 Beale Street in Louisville was held prior to the Board of Aldermen meeting on Tuesday evening. The property, an apartment complex formerly known by most as Eiland Plaza was classified as an "unclean property" by City officials. The hearing gave citizens, tenants and the owner, the opportunity to express opinions, air complaints and state any plans for improvement of the property. Code Enforcement Officer Jody Fulton indicated that he had recently inspected 12 apartments at the complex and found that all were out of code compliance - often for multiple issues including electrical service and plumbing issues. Fulton did indicate that one building that had represented a major code problem had been recently razed but the debris had yet to be removed. recognize all dispatchers and 911 personnel for the jobs they do. 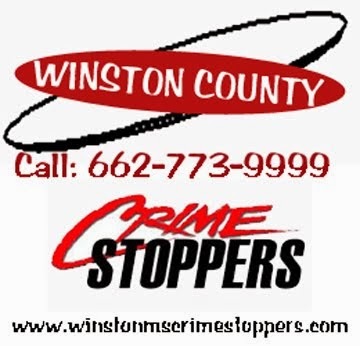 Our local E911 dispatchers serve all of Winston County and Louisville by answering calls for police, sheriff, fire and emergency medical services and dispatching the appropriate assistance as quickly as possible. These telecommunicators are a vital link between citizens in need and emergency services. They are professionals whose multi-tasking skills behind the scene and often unrecognized actions are responsible for helping protect citizens and property. The dispatchers work to improve the technology and operational capabilities through their leadership and participation in ongoing training programs designed to increase their skills and prepare for 911 calls. They work long hours to make sure the public's needs are met. 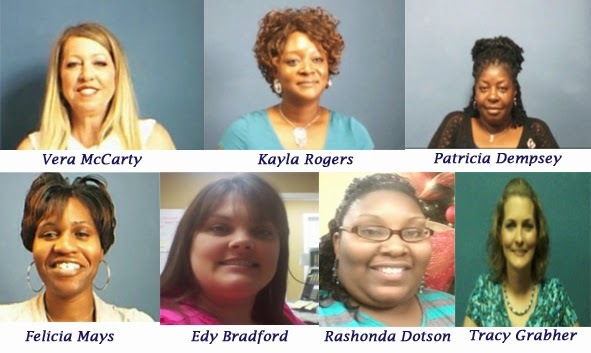 Louisville/Winston County Dispatchers include: Vera McCarty- 911 Coordinator, Kayla Rogers, Patricial Dempsey, Felicia Mays, Edy Bradford, Rashonda Dotson, Tracy Grabher. The annual Kids N Kats Fishing Rodeo is coming up at Legion State Park on Saturday, May 3rd. Youth ages 15 and under are invited to come out to the lake and participate. Prizes and lunch including hotdogs will be available. Registration begins at 7:00 am on Saturday morning and will continue til 8:00 am. Rodeo open to kids from 15 years of age and under. The clininc is open and well staffed and the community of Noxapater and surrounding area are being well served by the Winston Medical Clinic Noxapater Clinic. Now WMC and Noxpater are ready to celebrate with an Open House and Ribbon Cutting on Monday, April 28th. 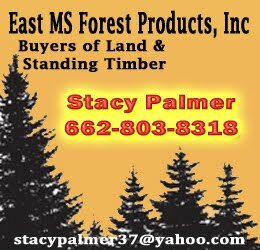 Mississippi Governor Phil Bryant will be on hand and serve as the guest speaker. Bryant will be present from 10 am– 11 am. The Open House will go through 1:00 p.m. with a free hotdog lunch sponsored by Vowell's Market and Clark Beverage. The public is encouraged to welcome Governor Phil Bryant at the WMC Noxapater Clinic on April 28th beginning at 10:00 a.m. For more information call 779-5111. 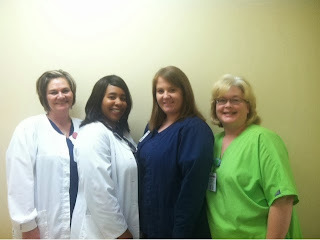 Winston Medical Clinic-Noxapater is located at 90 East Main Street, Noxapater, Ms 39346. The clinic opened its doors in December, 2013 and is staffed by Nurse Practitioner Nancy Jordan. The Winston County Library will host West Point author, Claire Spradling, as she gives a book talk and book signing on her new Christian fiction novel, Duress. Claire worked for many years at Winston Medical Center and Nursing Home and at Tri-County Nursing Home as a Dietitian. She will be at the library on Saturday, April 26 from 10:00 am til 12:00.
of life, the Rev. Charles Lee White, Jr. continues to distinguish himself as a leader, mentor and a mighty man of God. Rev. White believes in ministry beyond the walls of the church and is thankful for the opportunity to serve God through service to God's people. 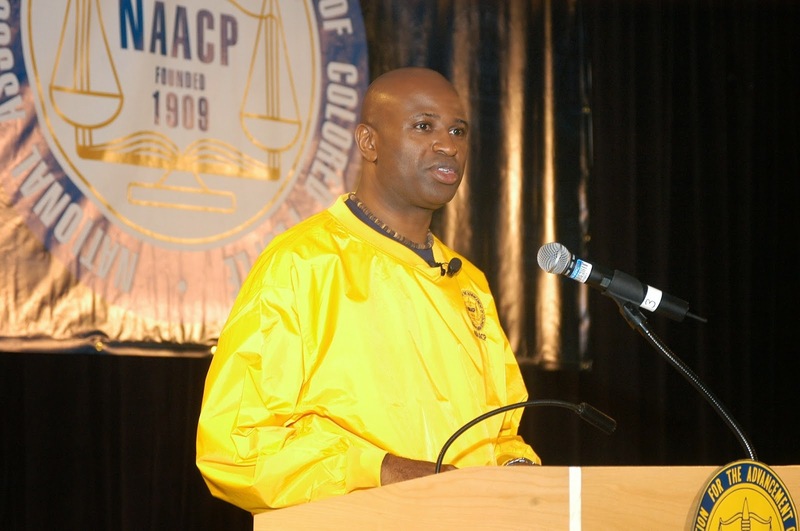 Reared as a member of the Wesley United Methodist Church, the Hollywood, SC native earned a Bachelor of Arts degree in Religious Studies from the University of South Carolina, later entering Gammon Theological Seminary of the Interdenominational Theological Center in Atlanta, Georgia, where he was conferred a Masters of Divinity with a concentration in Christian Education. Southern Storm Takes Orange Beach Competition by Storm!! Several girls from Louisville competed at Deep South's 2014 Cheer and Dance Beach Nationals in Orange Beach, Alabama on April 12-13. 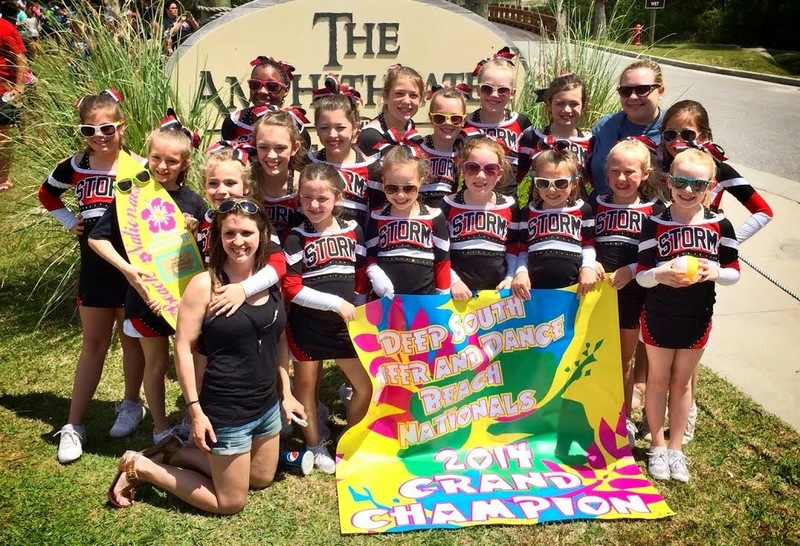 The Southern Storm youth squad placed 1st and won Grand Champion in the Level 1 Division. The girls competed agains thirty one Level 1 squads to win the title of Grand Champion. The Southern Storm junior squad placed 3rd in the level 2 division. The girls were also excited when their coach won the Coach's Award. 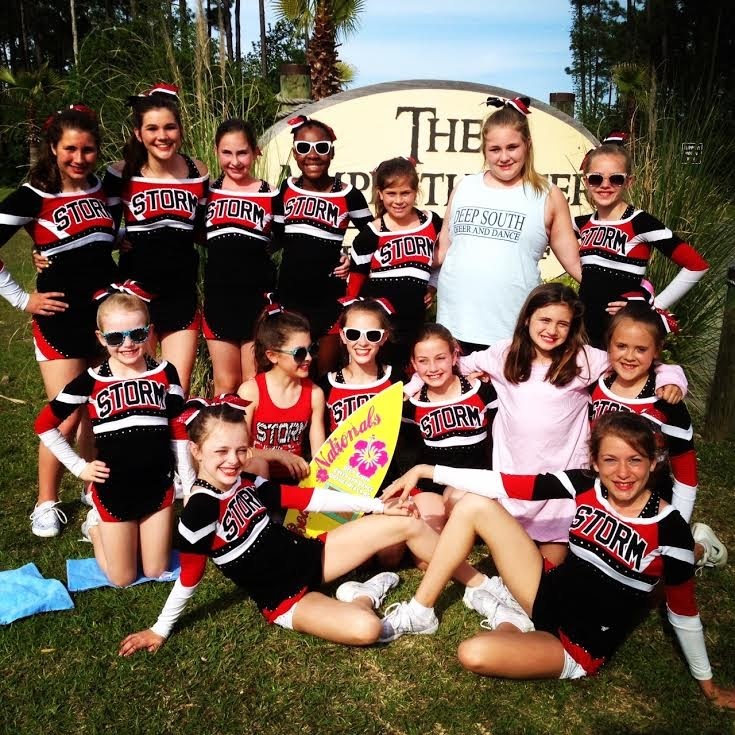 Southern Storm is a competitive cheer squad from the ACPA gym in Starkville. This was their 5th and final competition of the 2013-2014 season. The girls from Louisville on the youth squad are Maggie Claire Kirk, Emma Rae Fulcher, Sadie Stevenson, Amelia Anne Kirk, Haley Harris, Bella Grace Hillyer, Lana Raye Boatner, Braley Raye Dickerson, Ann Carter Perkins, Chloe Hillyer, Layton Nowell. The girls from Louisville on the junior level 2 squad are Chloe Hillyer, Amelia Anne Kirk, Emma Rae Fulcher, Maggie Claire Kirk, Lana Raye Boatner, Kalee Sullivan, Bella Grace Hillyer, Mary Jordan Milton, Sadie Stevenson, Kayden Fussell. 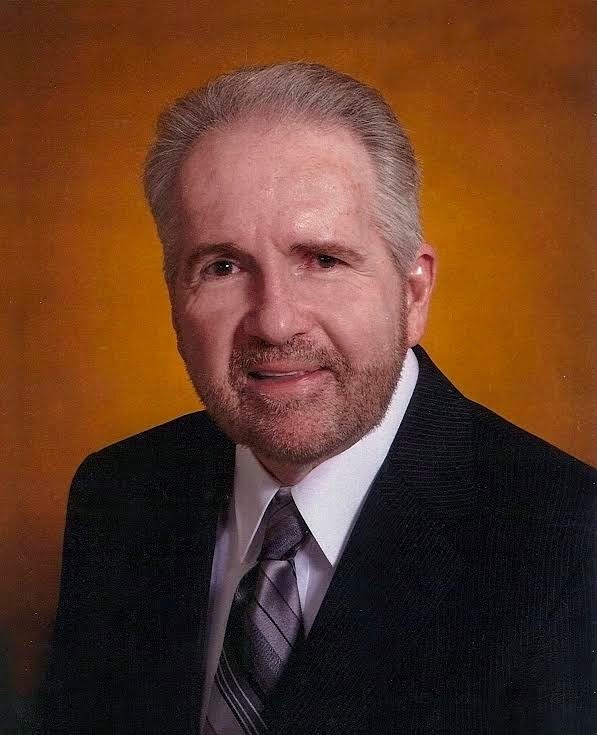 The East Central Community College family is in mourning following the passing of former president Dr.
Dr. Smith, 71, died Monday, April 14, 2014 at his home in Decatur, following a lengthy illness. He led the institution from 1985 to 2000 and served his alma mater as its sixth president. During Dr. Smith’s tenure, the college experienced unprecedented growth in numerous areas, especially in enrollment, program offerings, campus facilities and workforce education. An increased emphasis was placed on recruiting students of all ages. As a result of a closely followed recruitment and retention plan, enrollment increased each of his 15 years at the helm. Upon his retirement in 2000, the college’s Board of Trustees named the newly constructed Student Union in his honor, in recognition of his dedication to serving students of all ages. 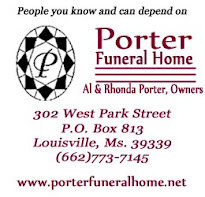 Milling Funeral Home in Union is in charge of arrangements. Schools Recognize "Parents of the Year"